We had a great time at our Sparty Party today!!!! Mrs. Mnich and Mrs. Tamer’s class will be hosting a craft and bake sale at our school. All donations will go to CHEO. Students are asked to bring in a dollar or a toonie to purchase an item or a baked good. The craft and bake sale will be taking place on Thursday March 7th, 2019 during the morning. The classes will be selling wind chimes, coasters, bracelets, and planting pots. It is a spring themed craft sale. There will also be a cake and teddy bear raffle. National Sweater Day is an opportunity to raise awareness about our climate and energy conservation, and show how together – classroom by classroom, school by school – we can be a part of the solution. On Thursday, March 7, St. Stephen will be having our own Sweater Day. Please wear a sweater to stay warm as we will lower the temperatures and learn more about how we can conserve energy each and every day! We will be celebrating Valentine's Day on Thursday of this week. If your child is bringing in Valentine's please have them write only who it is from. This helps with an easy flow distributing cards. Also due to allergies we ask that there are no food treats. Happy Valentine's Week! Don't forget to wear your favourite Christmas Sweater tomorrow! We wrote a letter to persuade Santa to send us a class elf. 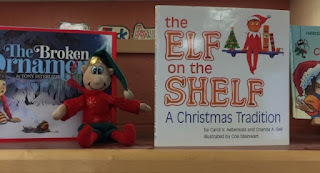 Our elf arrived and we've named him Snowflake! Our spelling test will be on Friday November 23rd, 2018. Every week Mrs. Mullen looks for a student who deserves special recognition! My name is Mrs.Mullen and I am so excited to have the opportunity to be your child's teacher! Please feel free to contact me by phone or by agenda and I will do my best to answer your questions. Please check the site frequently.